If you order in the Uckermark Nudln, it may well happen that golden potatoes are on your plate! On good Uckermärkisch the potato is called Nudl and is celebrated every year in October with the Nudlwochen. The reason why the potato is Nudl to us is no longer to be said with Certainness. Preparation: Cook peeled Nudln in unsalted water and press it even warmly through a "Nudl" press. Place the mass in the refrigerator for one day. Separate the egg yolk from the egg white. Mix the yolk with the sugar well. Peel and juice the lemon and stir the almonds underneath. Mix the Nudlteig with the yolk mixture. Beat the egg whites to snow and lift underneath. Place in the greased spring mould and bake for one hour at 175 degrees in the pre-heated oven. Preparation: Nudln wash, peel and cut lengthwise. Brush out a baking tray with olive oil, sprinkle the Nudln with the salt, place on the baking sheet, cover with rosemary twigs and approx. Bake 45 min at 180 °c in the oven. In between more often with olive oil. Especially suitable for lamb and game dishes. Preparation: Nudln washing, peeling, cooking (not altogether) and let it cool down a little. Hollow out the Nudln with a spoon, store the interior please. Then clean the mushrooms and chop them finely. In a pan, melt the butter, omit the bacon, fry the onion cubes and mushrooms in it, season and finally add the Nudlinnere. Now mix well and mix the chopped parsley. Fill the hollowed Nudln with this mass, put in a greased form, sprinkle with cheese and approx. 30 min. Bake at 170 – 180 °c in the oven. Wruken (cabbage beet stew): The Prenzlauer vegetable farmers were also called "Wrukenpropper" by the old Prenzlauern. They had their fields at the edge of the city-the so-called "Kuhdamm". Kloppschinken (Knocking Ham): The holiday food for poorer people was the Kloppschinken of smoked or cooked ham in milk and then breaded with bread breadcrumbs and egg. As a side dish there were beans with applesauce. Also Topfwurst or Grützwurst with sauerkraut and NUDLN is one of the classic food. And also the Uckermark praise Schlachteplatte. "All the land and tax Räthe, magistrates and civil servants": "As if you have to make the benefits of Anpflantzung of this terrestrial plant tangible to those who are and under-than, and to advise them that they are still this early year the Pflantzung of the Tartoffeln as a Very nutritious food company (…) "
WUTSCHNUDLN potatoes are mashed vigorously and fried with onions in bacon and then mixed and seasoned. It is sprinkled with chopped parsley. The Wutschnudln are served with fried eggs and beer. Pellnudln Uckermark praise like to eat quark with onions, linseed oil and sometimes also a piece of liver sausage or blood sausage. Typical are also Quetschnudln and sweet-sour eggs. Old typical recipes for tasting. Source: "1,000 tried-and-tested recipes collected for the Uckermark, Prenzlau 1910, A. Mieck." A delicious soup is prepared for fish residues or a part of pike. A part of the best meat is retained to the dumplings. The fish is cleaned and cut into small pieces, with cold water and salt brought to fire. Herb and roots, as well as some slices of toasted white bread also come to it. To the dumplings, the meat of the fish is chopped with half as much kidney tallow very fine and mixed with 2 eggs, salt, grated white bread, some pepper. One teaspoon then throws one dumpling after another into the soup. The 2 centimeters long broken green beans, or even schnitzel beans are softly cooked with so long beets and the mutton meat. Then the peeled Nudln are washed in, the beans etc. With the meat broth poured over it, added salt and the Nudln thus softened. Finally, some vinegar and chopped parsley comes to it. It must be thick mushy. The finely cradled veal roast is given in the following sauce and cooked in the same short time. 1 finely chopped onion is cooked in abundant butter, flour is added and so much milk that it becomes a creamy sauce. Finely chopped anchovies, lemon juice, capers, salt added and lastly rubbed to taste Parmesan cheese over it. And how does the Uckermark cook today? Mietkoch Jens Köhler has created new things on a traditional basis with a lot of verve. All ingredients of the recipes are calculated for 4 persons. 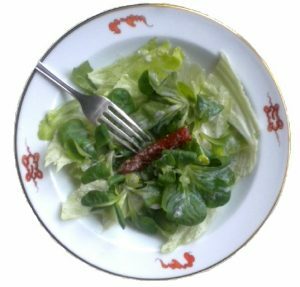 Leaf salads of the season (spring, summer, autumn, winter) with butter milk dressing leaf salads cleaning and washing (800g), 200 ml buttermilk, 1 small onion, some garlic, thyme, salt, pepper, sugar and after taste mix some lemon juice with a blender bar. 200 ml of oil (sunflower oils or vegetable oil) drop and mix until the dressing binds something. Mix with the leaf salad and serve. Roasted walnuts are suitable for this. Boil 2 litres of broth, peel the rutabaga as well as the potatoes (1 large Wrucke and 500g potatoes) and cut into 1 cm large cubes. Peel the parsley root as well and cut in 5 mm small cubes. Rutabaga, potatoes and parsley root into the boiling broth and add approx. Cook for 30 minu tes at low heat and season with a little nutmeg. Add the Lungwurst and let it get hot, chop some parsley and stir in the soup just before serving. 1 small Pike at the fisherman's shop, fillet and skin, let the head and bones be given extra. 1 bunch of soups green peel and cut small, with the bones and head, 1 to 2 bay leaves, some salt and 2 L of cold water approx. 1 hour Cook for a small heat. Wash 1 large cabbage and cut into thin slices, season with vinegar, apple juice and salt, and let it move for 30 minutes. Peel 1 kg of floury boiling potatoes (Nudln), cut small and cook softly. Caramelize 2 tablespoons of sugar and 1 tablespoon of butter, with 200 ml of cream or milk and dissolve. Prepare puree, season with salt and nutmeg. Cabbage in the apple-Essigsud 10 min stew. Portion the Pike fillet, season with salt and lemon, flour and fry for 3 minutes from each side. Bind the fund with flour sweat and season with 2 tsp Fliedermus. A dry Riesling is suitable for this. Heat the juice of 2 lemons with 6 tablespoons of sugar, add 6 sheets of soaked gelatine and dissolve. Stir in 400 ml of buttermilk and raise 200 ml of whipped cream. After 30 minutes, take fresh berries or jam and fill in small moulds. 2 hrs. Place cold and garnish with mint or lemon balm. 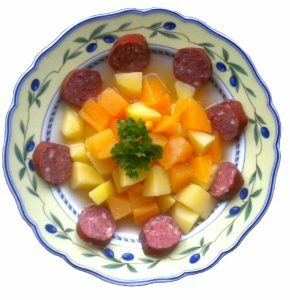 If you still have old Uckermark praise recipes, just send them to us. The knowledge of the old recipes is important for the consciousness of the whole county.